There are some highly unusual fares showing up on flights from Los Angeles to Bangkok, Thailand and then from Manila, Philippines back to Vancouver for as low as $345 CAD including taxes. They are possibly an error. a) a one way flight from Vancouver to Los Angeles. This typically costs around $150 CAD. b) a one way flight between Bangkok and Manila. This typically costs around $160 to $190 CAD. The end result would be a flight from Vancouver to Thailand to the Philippines (with the ability to spend time in each location) and then back to Vancouver, all for around $655 CAD including taxes. The key is first getting your hands on one of the $300-something flights. 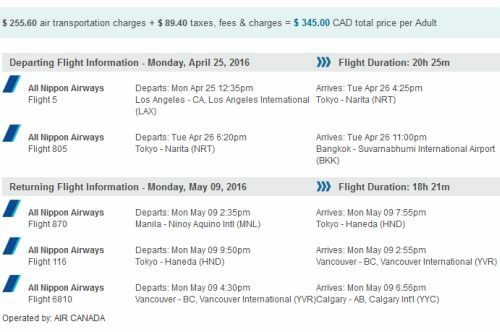 vancouver, yvr, flight deals, asia, bangkok, thailand, bkk, southeast asia, manila, philippines and ana all nippon airways.